Doha, Qatar, 27 January 2016 – Volkswagen Middle East presents the new generation of the best-selling Tiguan – the ultimate SUV for the urban jungle - at this year’s Qatar Motor Show. With new perceptibly sporty body proportions, the precision and logic of the second generation’s design gives it an unmistakably dominant character. 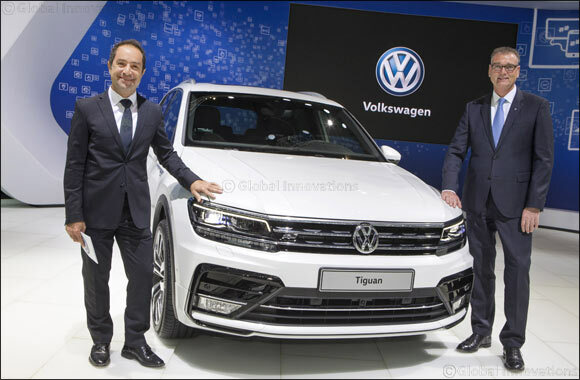 The latest model will be available in three new powertrains ranging from a 1.4L engine with an output of 150 HP, up to a 2.0L engine with a 220 HP and a six and seven-speed dual-clutch gearbox (DSG) with 4MOTION, which is now offered for the first time in the Tiguan. The new model will be available in five model configurations - S, SE, SE 2.0L, SEL and Sport with an additional sport R-Line package for both the interior and exterior. The new Tiguan is one of the world's most advanced Compact SUVs with impressive innovative features enhancing the vehicle's safety, convenience, infotainment and dynamism. These include the 12.3-inch Active Info display – an interactive, fully digital main instrumental panel and a Head-Up Display, offered for the first time in a Volkswagen SUV. Furthermore, ensuring complete passenger comfort and convenience are features such as Easy Open / Easy Close (automatic opening or closing of the tailgate in response to a specific foot movement behind the Tiguan) and power comfort seats with a memory feature. The interior is a model example of well thought-out ergonomics and intuitive operating structures. The interplay of the dash panel, centre console and door panels create a remarkably intuitive atmosphere for the driver. The weight of the new Tiguan was also reduced by over 50 kg compared to the previous model. Meanwhile, the space offered in the interior and luggage compartment has taken a gigantic leap forward. The boot volume of the new Tiguan can store up to 615 litres of cargo (loaded to the back of the rear bench); when the rear seat backrests are folded, its capacity increases to 1,655 litres. This represents a gain of 145 liters. The new Tiguan will be available in showrooms across the Middle East from August 2016. Also featured at the Qatar Motor Show is the Golf GTI Clubsport concept car – marking the 40th anniversary of the Golf GTI – alongside the fun and iconic Beetle Cabriolet and the family–friendly newly designed 2016 Passat.